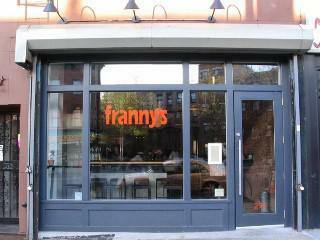 Franny’s is an establishment that makes it a point to be environmentally responsible. The owners place emphasis on quality, sustainability, and transparency with respect to the goings on of their business. The food is locally-grown and the menu contains seasonal foods. The beverages are fair-traded and sustainably produced. The energy that powers the establishment is renewable, 35% coming from wind energy while the remaining 65% comes from hydroelectric powerBiodiesel fuel. Biodiesal fuel is used as kitchen grease as well to minimize waste. Earth-friendly dishwashing products, to-go containers made from biodegradable materials and menus printed on recycled paper are also helps increase sustainability.